Only large lambskins with the softest, most lustrous wool finish achieve Classic's 5 Star Large grade. Tanned in New Zealand by Classic Sheepskins using only the highest quality lambskins. Classic Sheepskins have been tanning sheepskins since 1969 and are one of the few remaining sheepskin tanneries in New Zealand. Their success can be attributed to the excellent consistency in quality and value for money. Note the colors in swatch/example images may not be precise due to light distortion when photographing and reproduction of the images on differing computer screens. 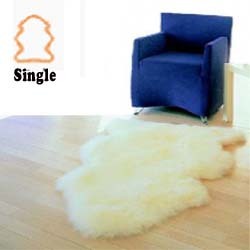 Furthermore the dyeing of natural sheepskin wool can vary due variations in the uptake of the dye into the wool fibers and differences between batches of dye. Machine wash on wool/gentle cycle or hand wash in warm water. Spin on gentle cycle to remove excess water. Do not tumble dry. Stretch the rug to shape while drying. It is recommended that colors are professionally dry-cleaned only.